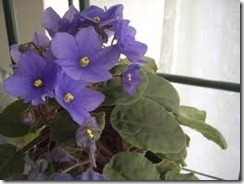 African violets have long been a household favourite. With proper care, they will bloom almost continuously. Here is an easy way to grow more. Fill a small pot with seed mix. Cut several young healthy leaves from the base of an established plant. These leaves must be mature and free of disease. Make a clean cut across the base of the stem. Dip the stem in the rooting powder. the hormones in the powder will encourage new growth. The rooting compound you choose should also contain a fungicide. Make a hole with a finger in the pot of seed mix. Push the stem gently into the hole. The base of the leave should be right at the surface of the mix. Press mix gently against the stem. Plant several leaves and beside each force in a small stake. Water the cuttings and wrap the plastic loosely over the stakes and pot. You can also put the pot in a large plastic bag and gather the top. You have created a tiny greenhouse. Keep in a warm, BUT NOT SUNNY, spot. Watch the leaf. In a few months you will notice tiny plants are appearing around the base of the leaf at the soil line. Remove the plastic. Separate. When the plants are several inches high, you can separate them into small individual pots. You have now created a whole new generation of African Violets. Do not put water directly on the leaves of African violets. They like light but not sunlight, originally growing in the shade of larger vegetation. Keep the soul, barely moist, but never wet. African Violets do best in high humidity, consistent temperature, shaded light, and moist but not wet soil. The easiest way to water African violets is to put the pot briefly in a bowl of cool water, drain, and return to their permanent home.